Laurien Morrison of Lakes Entrance got more than she bargained for when she walked through the doors of the Gippsland Vehicle Collection (GVC) on Sunday, 12 March. She was greeted by a cheering crowd, streamers, party whistles and the news that she was the GVC’s 100,000th visitor. Mrs Morrison received a gift pack including 12 months’ membership at the GVC, vouchers donated by WillGrow Landscaping and the Macalister Hotel and a bottle of wine donated by Avon Ridge Vineyard. An excited Mrs Morrison said she and her husband David visit the GVC a couple of times a year. 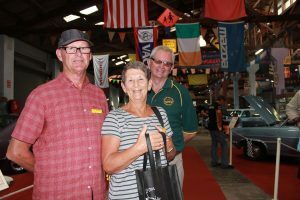 “David has an FJ Holden and we are members of the Classic and Historic Automobile Club, Riviera Lakes, so we are very car-orientated,” she said. GVC President Duncan Malcolm presented Mrs Morrison with her prizes and said the milestone was a great credit to the GVC, which is fully operated by volunteers. “It’s very exciting for us to mark this milestone after 11 years of being open to the public,” Mr Malcolm said. “We wouldn’t be where we are today without the support of our fantastic volunteers, who do everything from organising the vehicles from the exhibit to dusting them while they are here, keeping the building and grounds in order, and cooking and baking to feed our visitors. Mr Malcolm said a key to the Museum’s success was the regular change-over of exhibits in March, July and November every year, and the number of engaging events held by the GVC each year, as well as its active participation in the motoring enthusiast community.